Beauty Expert Bhavna Kohli shares tips and ideas for brides who wants to look elegant, and yet not under-dressed. Creating the perfect wedding can be the hardest part for a bride- too less and you may get those 'you-don't-look-like-the-bride' glares, too much and you can be sure you'll look like an over-decorated Christmas tree..
An elegant bride doesn't mean an underdressed bride- here is a simple guide on how to achieve that oh-so-perfect balance and look like the bride. Always view your look in totality - the outfit along with every single accessory and of course the hair and makeup. The trick lies in getting the play between these to work for you. The sari and the lehenga are elegant and can be given a modern yet classy twist with a few subtle elements. A sari has timeless elegance, couple it with different kinds of blouses to give it that modern twist. Choose a delicate material like the much-in-fashion lace in colours like pale green, mauve, gold, light pink with hand embroidery, motifs or subtle borders. A metallic petticoat can be the perfect foil to lift the colour of your see-through net sari. Team this with a delicate diamond and platinum neckpiece and earrings. Avoid colored bangles and go for diamond kadas to match with the neckpiece. Ensure that your sari falls well by wearing a pair of heels, of course- in a metallic colour that complements the work on your sari. If you prefer a lehenga but don't want to go the traditional route, opt for a rich material in colours like cream and gold, lemon, deep blue or leaf green. Avoid traditional all-over work and go for delicate motifs, borders or embellishments - once again the trick is to know where to stop the bling. Pick jewellery which accentuates the colour and the embellishments of your outfit. If your outfit has dull gold work choose a light neck piece in kundan with a matching delicate maang tikka and bangles. If your outfit is leaning towards silver work go with a platinum and diamond neckpiece. 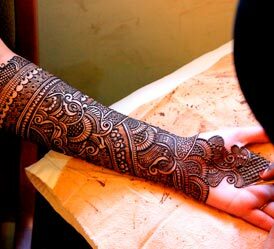 Like in the sari avoid colored bangles and go for a couple of kadas. Team this up with a pair of heels with a bit of platform in the front for comfort. Designers like Rocky S, Abdul Halder, and Ankur Batra (Ecru) have showcased several outfits in their recent collections that address the need for the sophisticated and understated bride. Most brides spend a lot of time focussing their efforts on the actual D day- but it's equally important to prepare the skin well in advance. Invest in some good skin care services - not only for your face but also for areas like you back and arms which will be visible! 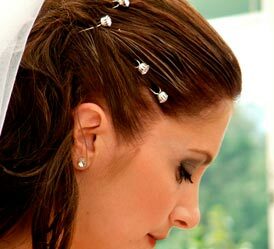 Kaya Skin Clinic has some excellent services that can be customised to meet the individual needs of brides. The makeup & hair needs to complete the overall look- subtle and classy. The most important thing in the makeup is to create the look of dewy glowing skin. Ask your make-up artist to mix some highlighter like MAC Strobe cream while working the foundation on areas like the cheekbone, forehead, chin and nose. Follow this with a warm pinkish or coral blusher on the cheek bones. The eyes should have a wash of silver or gold topped with eyeliner and kajal to draw focus. The lips can be a fresh colour like pink, peach, coral or light brown - top it with a generous coat of gloss and you are good to go! Two areas that brides must not forget-body make-up and nails. Ensure that your arms, back and collar bones are moisturised and dusted with body shimmer. The best option for nails is a neat French manicure. The hair can be put into a nice updo like a French twist or a low bun with a side parting. Stay clear of big maang tikas opting for delicate ones to match your jewellery. Add a couple of fresh flowers to the bun - like a pair of peach roses or white carnations. Do spend some time in advance with your make-up artist to explain your preferences and discuss your look.